Go to Barnes and Noble.com to order your pre-release copy - this is a collectors cover, it's not the final choice. Come start the journey of a lifetime. I promised my faithful THM family (that’s you!) 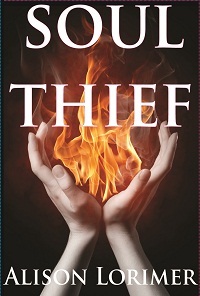 that they’d get the first glimpse of Soul Thief before it hit the Amazon/Barnes and Noble world. This is the day! I encourage you to sign up for the email alerts on THM. It’s <– over there, somewhere. If I have your email (well, I don’t actually see them) I will be sending out book two updates to the people who subscribed. No, RSS feeds aren’t going to work, peeps. 🙂 But you will get some indie info as I start the movie script and all that stuff. If you fall in love with this story like most have, you’ll want to know ~ it’s next May when the Soul Keeper comes out! So here are the legal speak things that the publisher requires me to say. First, the following is the prologue of a fiction title. It is copyrighted, on file with the library of congress, and seemly guarded by some really buff SEALs. Okay, that last part is me, as I am currently infatuated with a real life SEAL. Writing is a tough job. 🙂 So, no copy copy, people. It’s a tiny taste of what Katherine gets herself into ~ the real book is a whopping 115,000 words. The book has garnered some wildly popular reviews…and yes, I am taking on the Divine as a subject in my book. I have to admit, once I read it, even I wanted book two to be done. So, copyrights notice given, here are the first three pages…..the Amazon sample is bigger. You can see that in a few days! Enjoy the sneak peek. Love to you, write me…I need to hear your thoughts! I wish I could convince myself this was a dream. The pain is too much. The air is hot, sour and almost impossible to breath. It feels thick and acidic against my tongue, like a gag over my lips. It’s only been hours—I think—since they slammed the iron door over the cave-like hole. Sealed in, I fade into the pitch black of my mind and then come back to life again. It feels like a tomb. I can’t stand, can’t navigate the slimy surface of the floor beneath me. There is no light. The sounds are vague, haunting, as though there is someone screaming not far away. For a fleeting moment, I can hear Michael’s voice in my soul. I push back against the wall and get my knees under me. I breathe in again, feel pain from the broken ribs on my left side and close my eyes to get my bearings. It is easier with my eyes closed to try to think through what Michael would do if he were here. Idiot. He would have never been vulnerable in the first place. I am trying not to give in to the gnawing fear that laces through me. Help me, I think, trying to focus. I don’t know how to get out of here. The pain washes back in when I shift weight onto my broken ankle. For a second the sobs overcome me, a pulsing pain that is beginning to numb me into unconsciousness. There is the edge of blackness, a feeling of falling into the hot strangulation of unbreathable air. Katherine. It is the whisper of Lucian’s voice that teases me from my black reverie, the hint of a different air filling my lungs. I ease my eyes open for a moment and find myself sprawled against the wall again, covered in the deepest black of absent light. In a place with no light and no hope, there is little to do but think. As words come to mind, I can see the ghosts of the past fourteen days as they dance in front of me. There is no need to reach out. They’re a grainy image like the oldest black and white film. I see vague images of a woman buried alive. I’m watching myself from outside my own body. When I trace my steps back in time, I can’t seem to remember a moment when I wasn’t on the path that led me here. I have failed so miserably and still found the only thing worth living for—knowing that he is out there. “Lucian?” Screaming his name changes nothing. Fear and anger well up inside me, burning tears down my face, choking my already strained breathing. I bang my hand against the wall beside me, feel the shot of pain, and remember the burn. My voice is hoarse and barely audible, the stroke at the wall ineffective. My hand drops back into the mucky earth underneath me, dulling the pain. Nothing happens. Katherine. It is just the slightest whisper, but I can hear it. “Lucian,” I scream again, pushing my weight against the broken ankle, the burned hand, scrambling on my hands and knees to the opening. I frantically press my hands against the rotting metal and start pushing against the door with everything that I have. “Azazel let me out of here!” I rage blindly. I am the trap that was set for Lucian, the love of my life. For another moment I push to dislodge the door. Nothing. I start searching the wall again, wishing that it held it any kind of hope. “Coward,” I scream in frustration one more time and collapse to the floor. I believe that Lucian can hear me. I still believe that he loves me. I understand the monster that haunts his soul. I know the man that he is. I feel the love that he and I share in every cell of my body, in every breath that almost fills my lungs and leaves me gasping for fresh, clean air. Even now, when it’s utterly impossible to find hope, I can’t be sorry. Maybe this is the end of my life. I don’t care. There is only one thing of which I am utterly and unchangeably certain of. A love like this is the reason that the world even exists. Not just now, in the face of pain, but for forever. Forever. As darkness closes over me again, I embrace the cool autumn air of life. I remember how this all started…. Now, log on to B & N and get the real story…..